Has anyone fabricated something below rear corners for more protection? Here's what I've done. Looks like I need to do some paint touch up over the winter! The bumper is still fully removable, although I haven't had need to remove it since I added the rear quarter protection 15 years ago. 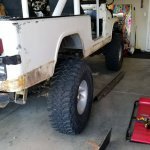 I had a local guy fab these up for me, and weld them to the Rock Hard rear bumper. They work great. I like your anti- theft device too... I wouldn't mess with a Jeep with spikes like that coming out of the bed!